Machine malfunctions and breakdowns can cause long downtimes, especially in intralogistics, causing production and delivery to come to a complete halt. High-quality systems can help prevent such costly consequences beforehand, but they still require maintenance and service. This is where the BEUMER Group customer support experts come in: BEUMER offers qualified maintenance and service world-wide to ensure a high level of system availability. One customer, for example, is Dangote, a cement manufacturer in Nigeria, where BEUMER specialists successfully increased the capacity of one of the older bucket elevators, using the latest heavy-duty technology. African company Dangote, based in Lagos, Nigeria has two ambitious goals — to compete with the leading cement manufacturers world-wide and prepare for an upcoming construction boom. Africa is an emerging continent, where the demand for cement is steadily increasing due to the continuously growing population and the need for infrastructure development. Dangote has been using BEUMER systems such as loading systems, belt conveyors and bucket elevators for years. Systems from third-party suppliers are also used. “When it came to a belt misalignment on a bucket elevator used for feeding silos with a height of more than 60 metres, we repeatedly had to endure production downtimes,” explains Kornelius Thimm, head of Customer Support for BEUMER in Beckum, Germany. This is a typical problem, according to Thimm. The system had to be stopped repeatedly for the workers to correct the error. In the long run, however, this needed to be corrected. The cement manufacturer had made various service agreements with BEUMER Customer Support. “On principle, our agreements are specially designed to meet the individual requirements of the customer,” explains Thimm. In order for them to be optimally tailored to meet the customer’s needs, a BEUMER service technician evaluated all of Dangote’s on-site systems. The agreements can range from only maintenance and inspection to a long-term placement of service personnel on site. BEUMER Belt Management, for example, helps to avoid downtime through regular inspections and timely replacement of bucket elevator belts. The Residential Service comprises technical support, preventative maintenance and inspection, emergency plans, system and process analyses and optimization as well as spare parts and facility management. BEUMER specialists work together with the customer to find a sustainable solution. “Our goal is to further improve trouble-free intralogistic processes in order to guarantee value-added material flow,” explains Thimm. In this case, the modernization of the plant was recommended. “We didn’t just want to repair the errors, but actively support the company to meet upcoming capacity and technology requirements,” says Thimm. After an in-depth consultation with BEUMER specialists, the belt and the buckets were replaced with the latest heavy-duty technology developed from BEUMER. This solution offers buckets that are mounted firmly to the back of the belt by segments and bolts. Belts with wire-free zones are used for the heavy-duty bucket elevators just as with all BEUMER belt bucket elevators. The buckets can be fastened to the belt without damaging the steel wires or even cutting them. The traction forces of the bucket elevator belt are maintained to the full extent. 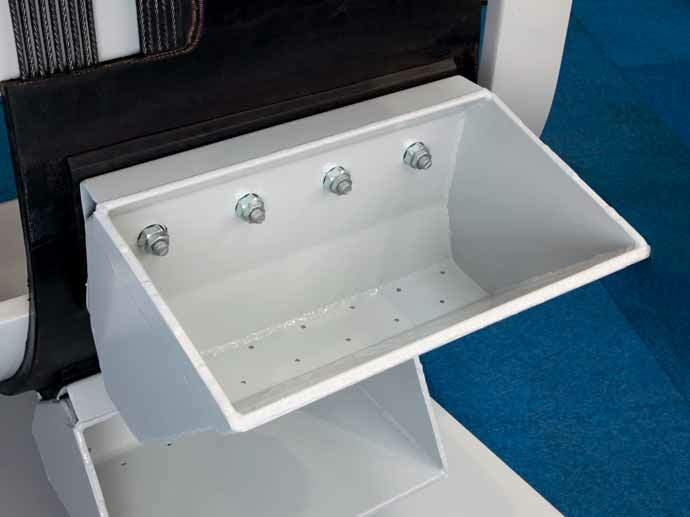 The new bucket shape also allows for smoother running and therefore less noise generation. Furthermore, the return pulleys were replaced. “The new conveyor belts are more resistant against mechanical wear, and they can transport coarse- grained material and high mass flows. All this makes the new heavy-duty bucket elevator the preferred product for this customer,” explains Thimm. This solution helps the cement manufacturer to increase the availability of the bucket elevator, reduce energy consumption and extend service life and makes the company more competitive in the long term, as opposed to the replacement of only one belt. “If we assume that the new BEUMER solution lasts twice as long as the old belt, the modification would have paid off after a short period of time,” confirms Thimm. For the BEUMER Group, the Customer Support department is more than just service. Customer Support is a separate department on its own, independent of conveying and loading technology, palletizing and packaging technology and sortation and distribution systems. “It’s basically a company within the company”, explains Thimm. “We have our own Sales department, which allows us to implement projects independently.” The goal is to support the customer for even better results. The head of Customer Support identifies a pronounced trend: there are still customers who invest in their own skilled maintenance personnel, but more and more companies want to delegate this responsibility. BEUMER offers the customers an all-inclusive service — everything from one source. BEUMER Group employees take on the responsibility for operating times, performance and economic efficiency of the systems and are trained regularly to stay up-to-date with the latest technology so the customer can concentrate on their core business. “Overtime, the number of technicians assigned to Dangote will increase to ensure machine availability as the increasing requirements will require a tremendous amount of time and work, impossible for one technician alone to accomplish,” explains Thimm. Limited in 2011, BEUMER Group has expanded its business activities in India as well. This increased the company’s market presence in the cement industry in one of the most important growth markets world-wide. These are only a few examples of BEUMER Group’s worldwide presence. Its Customer Support experts are available at any time, so the customer will receive optimal support and a high level of machine availability from installation through the entire operating period. BEUMER sets high standards for its Customer Support employees. When systems are installed and used in other countries, BEUMER believes that the customer should have access to a Customer Support technician that originates from the same cultural background and speaks the same language. “For this reason we cannot just send any colleague from Beckum to Africa or Southeast Asia,” says Thimm. Successful customer support requires successful communication. How is the customer positioned? What are their goals and how do they want to develop in the future? These questions require tact and cultural know-how. BEUMER is a global company and capable of meeting this challenge. “We are in permanent contact with the company,” explains Thimm. BEUMER is not just dropping by for one or two days to do the basic maintenance work. The goal is long-term support. their differences,” he explains. For products that are not part of the BEUMER portfolio, Customer Support assumes the function of a general maintenance department: “In case of malfunctions, we correct them and carry out the maintenance work as indicated by the third-party supplier,” explains Thimm. In Nigeria, there are many Chinese suppliers in the market. Dangote uses many Asian systems besides the BEUMER systems. “That is why we have a service technician on site who has also a lot of experience with the Chinese market and its products”, says Thimm. BEUMER Group is an international manufacturer active in intralogistics in the fields of conveying, loading, palletizing, packaging, sortation and distribution technology. Together with Crisplant a/s and Enexco Teknologies India Limited, BEUMER Group employs about 3,500 people and achieves an annual turnover of about €512 million. With its subsidiaries and sales agencies, BEUMER Group is present in many industries worldwide. Long detours may make the transport of raw materials from the mining area to the processing plant considerably more complicated and expensive. In many cases, however, local factors such as mountainous terrain, heavily populated areas or wide rivers interfere with a smooth material flow. This report describes the situation of a cement plant in Sudan, where a direct, straight link between the mining area and the processing plant seemed impossible to establish. The report then goes on to present RopeCon® as an alternative system of transport with which all difficulties could be resolved. To meet the daily demand of 9,000 tonnes of limestone for Berber Cement Company’s new cement plant, a modern crushing plant has been installed 8km away from the processing plant on the western side of the River Nile. Land transportation of 9,000 tonnes per day encounters a massive natural obstacle: the Nile, the world’s longest river and approximately 850m wide in this area. The transport of the material from west to east can only be done by constructing a bridge across the river, by using small barges or by using a ropeway-type system, crossing the river between two towers. At the time of the plant study, there was no existing bridge in the area nor were there any plans for constructing a new bridge. To overcome these difficulties and to find the most economic and reliable solution, a study was commissioned to investigate whether RopeCon® might be a suitable alternative. The system is briefly described below, and the report then details the solution worked out for Berber Cement. RopeCon® is designed and manufactured by the Austrian company Doppelmayr Transport Technology. The system combines proven ropeway technology with the features of conventional belt conveyors. The continuous conveyor is elevated off the ground, thus reducing space requirements on the ground to a minimum. RopeCon® easily crosses obstacles such as deep valleys, mountainous terrain, rivers, roads or other infrastructure, thus allowing for a straight route between the loading and the discharge point while avoiding unnecessary detours. The below description briefly explains the main components and features of RopeCon® and highlights the potential of the system as well as possible applications. RopeCon® consists of a flat belt with corrugated side walls.The belt may be fabric-reinforced or a steel cord belt, depending on the application. The corrugated side walls are cold-bonded or vulcanized onto the belt. The individual belt sections are joined by way of vulcanization to form one continuous belt, just as on conventional belt conveyors. The belt is fixed to steel axles arranged at regular intervals which support the belt. Polyamide running wheels are fitted to either end of the axles. These wheel sets run on track ropes and provide positive belt guidance while preventing the belt from skewing. The combination of polyamide wheels on steel track ropes minimizes rolling resistance and therefore energy requirements. rope for the inspection vehicle by means of which each point along the line can be accessed. Track rope frames are fitted to the ropes at regular intervals to maintain the ropes in their relevant position and to distribute the loads. The ropes have fixed anchoring at both ends and are guided over tower structures, similar to passenger ropeways. Depending on the terrain and on the individual requirements of each project, different types of RopeCon® tower structures are used. The belt performs the haulage function, as on conventional belt conveyors. The belt is driven and turned back by a drive drum in the head or tail station. After the material has been discharged, a turning device turns the belt by 180° to bring the soiled side of the belt upwards once more and to prevent residual material from falling off the bottom belt. The belt is turned once more before it runs onto the drum again in the loading station. The drive system is similar to that of a conventional belt conveyor and consists of a gearbox and an electric motor. RopeCon® features two independent mechanical braking systems. All braking actions are regulated to ensure constant deceleration and a controlled stop of RopeCon® under all circumstances. When all conventional options to transport the material from one side of the Nile to the other seemed to meet with certain difficulties, Berber Cement decided to look into a RopeCon® solution for its problem. The loading station is located right on the western shore of the river, immediately behind the crusher. The material arrives on trucks. The crushed stone is loaded onto RopeCon® via a feed conveyor and a chute. RopeCon® spans the Nile with a single large rope span between two tower structures positioned on either side of the river. It is not necessary to have a support structure in the river. The total length of the Berber Cement RopeCon® is approximately 3,465 metres from the loading station to the discharge station. Its transport capacity is 700tph (tonnes per hour). Due to river navigation, the minimum clearance between the system and the high water level of the Nile must always be 21 metres. The tallest tower is almost 80 metres in height. Apart from the crossing of the river, other aspects of the transport were also taken into consideration, one of them being the space requirements of ground mounted systems: in this desert country, the shores of the Nile form one narrow corridor of fertile land which is used for farming. A road would cut right through this valuable strip of land. RopeCon®, a system that is elevated off the ground, is able to span this corridor with just a few tower structures and requires no division of the valuable farm land along the shores of the river. and dust. With RopeCon® such truck runs can be avoided, and along with them any noise and dust pollution. The system’s low rolling resistance helps keep operating costs low, whereas the maintenance of an entire fleet of trucks as well as of a road would have resulted in considerable expenses. Virtually all moving parts of RopeCon® are mounted on the belt, which means that they keep travelling through the stations where they can be easily maintained. No complicated maintenance lines or platforms are required. Any inspections of the line can be performed with the inspection vehicle. Once the customer had decided in favour of RopeCon®, planning and production started right away at Doppelmayr Transport Technology. Right from the start, all calculations must consider the situation on site, in particular the local climate with its great variation in temperature. Throughout their work, the assembly team also met with great challenges, among them the heat and several sandstorms. A massive crawler crane was needed for the assembly of the tower structures, some of which are almost 80 metres in height. At first, several smaller sub- sections of the towers were assembled which were then fitted together to form the final tower structure. The first auxiliary rope used to pull other, stronger auxiliary ropes and finally also the track ropes, was taken across the wide river in a boat and had to be tensioned immediately so as not to hinder river navigation. This RopeCon® has been operating since 2011 and acts as a feeder to the cement plant. Doppelmayr Transport Technology is a 100% subsidiary of the Doppelmayr/Garaventa group headquartered in Wolfurt, Austria. The Doppelmayr/Garaventa group is the quality and technology leader in ropeway engineering, and designs, plans and manufactures material transport systems, passenger ropeways, automated transport systems and fully automatic high rise warehouses. At the bauma 2013 exhibition, which took place in Munich in April this year, SENNEBOGEN presented the first machine of the new SENNEBOGEN EQ line alongside the 8130 EQ. This machine concept offers high energy efficiency and maximum cost savings. The Equilibrium system (EQ) guarantees the lowest energy costs and operating costs and thus offers savings up to 75% compared with conventional drive solutions. The first machine entered service in October, and SENNEBOGEN is now presenting two additional balancer models. The new 8100 EQ and its bigger ‘brother’ the 8160 EQ extend the SENNEBOGEN range in both directions. The first SENNEBOGEN equilibrium handler has been working in a German paper mill since October. It has a reach of up to 27m, and a maximum working load of 10 tonnes, enabling it to conveniently cover the entire 2,300m2 work area. Here wood is unloaded by the tonne, sorted and prepared for further processing. Thus as a stationary solution the machine not only covers a maximum amount of work space, thanks to its extensive reach and high working loads, it also handles the work of two comparable mobile machines. Now SENNEBOGEN is further extending the success of this machine concept. The firm is supplementing the extensive SENNEBOGEN product range with the little brother 8100 EQ and the 8160 EQ as the next larger machine. With a safe working load of 4.5 tonnes and a reach of 23m, the new SENNEBOGEN 8100 EQ is made for effective materials handling on the scrapyard. Whether the task is charging the shredder or the scrap press, or sorting and stacking material, the 8100 EQ is an ideal tool. For areas of up to 1,700m2 the balancer concept is already practical and profitable with just one stationary electric machine. In the future, with the new 8160 EQ, SENNEBOGEN will offer a machine with increased capacity data and a larger work area. With 27m or 30m reach and high force reserves, thanks to the 160kW electric motor, the 8160 EQ is a reliable partner. With area coverage of almost 3,000m2 and a safe working load of 5.5 tonnes, the machine offers the best prerequisites for effective loading and sorting, and whether at the lumberyard, in port and industrial applications, or on the scrapyard. effective transmission of force. With each work movement the forces are held in balance in accordance with the classic lever principle. Thus the expenditure of force for moving the equipment can almost be completely dispensed with. Even with high loads and a large reach, only the attached load must be moved and driven — incredible savings in force and energy. Savings in operating costs and energy costs of up to 50% can be achieved through the well-designed balancer concept alone. Combined with the electro-hydraulic drive concept additional significant savings are possible. THE HIGHEST LEVEL OF PROFITABILITY FOR MATERIAL HANDLING, GUARANTEED — EQ TECHNOLOGY The new SENNEBOGEN 8160 EQ can be used in port transshipment, in particular, or at the scrapyard. Wherever the requirement is to move large quantities of bulk goods or scrap economically, the balancer technology shows its strengths. From a central position, multiple work steps can be optimally executed and the overview is always ensured thanks to the mast structure and elevated cab position. Moreover the machine guarantees maximum profitability and productive work sequences in port transshipment applications. The SENNEBOGEN 8160 EQ is optimally suited for ships to the Handysize class. SENNEBOGEN stands for individual, customer-specific solutions, and thanks to the modular structure of the machine, diverse equipment variants are possible at any time. From stationary undercarriages, crawler tracks or rail solutions, extending to pontoon setup, many versions can be implemented. The machines can also be delivered with diesel engines as an option. In addition to the customer-specific concept, SENNEBOGEN also convinces with more than 60 years of experience through the best quality and longest service life, and is even able to satisfy the most rigorous requirements. A close-meshed dealer and service network ensures competent local partners and first class maintenance and spare parts supply worldwide.